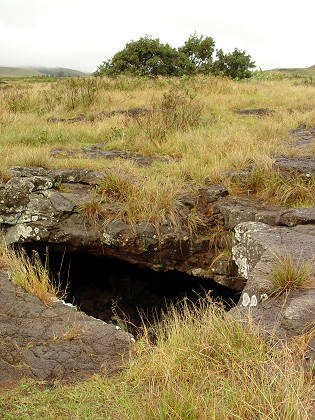 Standing on the surface, looking into the depression where the cave starts. There was a riot of vegetation growing in the depression. Standing inside the depression, looking up at some bananas. 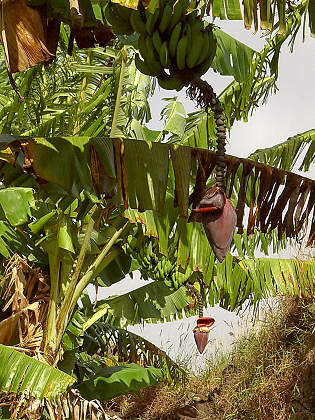 Banana trees have a weird-looking "thing" hanging down, which is actually the bud that produces flowers that mature into bananas. The flowers grow inside the bud and are hooded by the purple petals. In the background you can see where a petal has peeled back exposing several flowers. For some reason, the stalk and bud keep growing and producing flowers, but only the flowers way back at the beginning of the stalk actually mature into bananas. 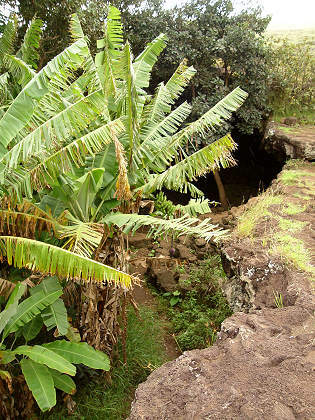 Each tree produces one stalk of bananas and once the bananas are ripe the tree dies. However it regenerates itself indefinitely from root bulbs underground. After spending quite a while exploring the cave and taking lots of pictures, I climbed back to the surface to try to find some skylight openings. While I was walking around it started to rain, a hard pelting rain, and I ran back to the car to sit out the shower. I was a little concerned that the dirt road would become muddy and difficult to travel, but the shower lasted only 15 minutes and didn't mess up the road. 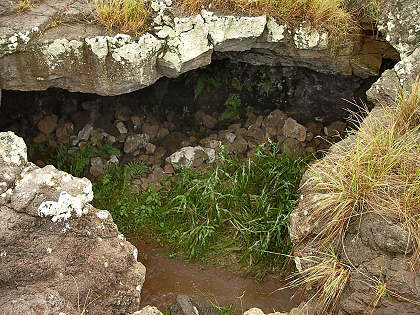 After the rain stopped, I resumed searching for skylights and found an opening in part of the cave I hadn't visited. It was filled with beautiful lush green plants, like a natural terrarium that protected the plants from severe conditions. Two different skylights, as seen from the surface looking into the skylight. You obviously need to watch where you're walking when you explore around here.